Find hotel near Parrocchia Di Bolzano Vic ..
Parrocchia Di Bolzano Vicentino - S.maria is a church located in Bolzano Vicentino, Italy. The church is built in white and brown stone and has three doors along the front facade. There is a bell tower located along the right of the church. Church masses happen every Saturday and Sunday but it is always advisable to call before visiting. The church has plenty of parking space available. Find the joy in planning a D.I.Y. trip by using this awesome Bolzano Vicentino trip planner. Fine Accommodation options like Hotel Scaldaferro, Hotel Verdi, Rometta Hotel and Key Hotel will meet your requirement of where to stay in Bolzano Vicentino. Curated Bolzano Vicentino vacation packages await! Book the best ones and start turning your dream into reality.Discover various ways for how to reach Bolzano Vicentino and complete the booking by choosing your mode of transport. Love this? Explore the entire list of places to visit in Bolzano Vicentino before you plan your trip. Fancy a good night's sleep after a tiring day? Check out where to stay in Bolzano Vicentino and book an accommodation of your choice. Igreja em Bolzano Vicentino, reconstruída nos tempos modernos, preservando o seu charme, especialmente no interior. Afrescos datados de 1935 executados por Ubaldo Oppi. 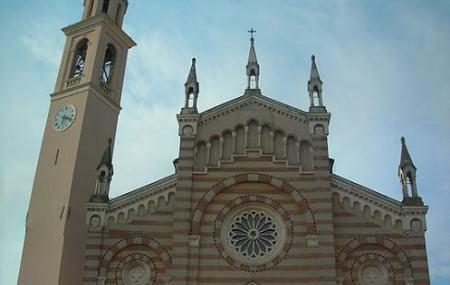 Bella chiesa con affreschi di Oppi. É una Chiesa molto bella ha dei dipinti meravigliosi del pittore Ubaldo Oppi.